Objective: A randomized trial to prove that liver resection improves survival of colorectal cancer liver metastases (CRLM) patients is neither feasible nor ethical. The objective of this study is to test this assertion using a quasi-randomized instrumental-variable approach. Methods: We abstracted data on patients with synchronous CRLM using California Cancer Registry from 2000-2012 and linked the records to the Office of Statewide Health Planning Inpatient Database. Resection rates in a patient’s neighborhood (within 50-mile radius) was defined as the instrumental variable and IV analyses were performed using 2SRI method. Results: A total of 22,870 patients were diagnosed with stage-IV colorectal cancer of which 16,382 (72%) had synchronous CRLM. Liver resection was performed in 1,635/16,382 (9.8%) patients. Resection-rate across the neighborhoods ranged from 7.9% in the lowest-quintile to 11.2% in the highest-quintile (Figure1). However patient-demographics, disease burden, clinicopathologic and other treatment characteristics were similar. 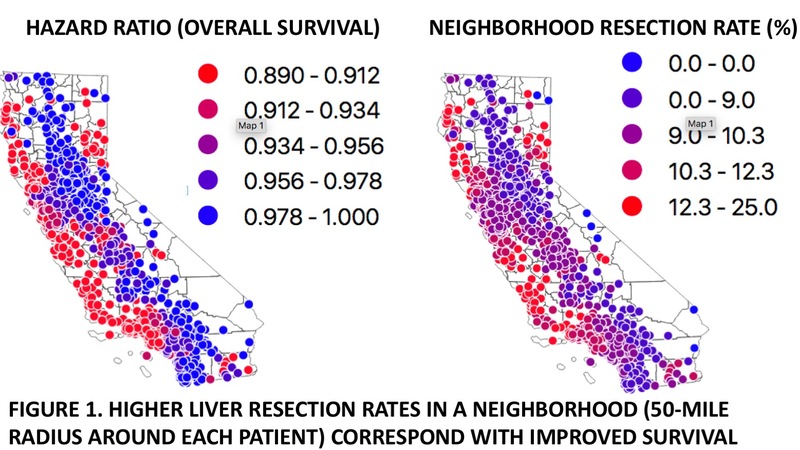 IV analysis revealed that for patients whose treatment choices were influenced by the rates of resection in their neighborhood (marginal patients), liver resection resulted in a significant increase in overall survival (HR 0.59, 95%CI 0.50-0.69, p<0.001) after accounting for measured and unmeasured confounders. Conclusions: These findings suggest a causal effect of liver resection on survival of patients with CRLM at the population-level. Our results directly apply to patients in whom treatment choices are influenced by physician beliefs, practice patterns and surgical capability.